Photos from Brian Watkiss, no reproduction without permission. 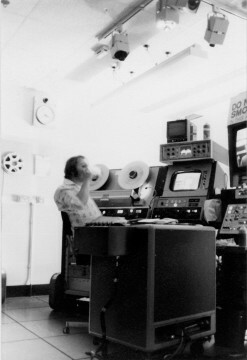 These photos show the 2″ Video Tape machines in the VT area of Pebble Mill. 2″ video tape was widely used in the 1970s before 1″ tape took over. The main problem with 2″ tape was that you couldn’t spool in vision, so if you were looking for a clip from a show, you’d have to keep stopping periodically to see if you were on the right item. Pebble Mill kept a 2″ machine right into the 1990s, for viewing and clipping archive tapes. The photos probably date from the late 1970s. 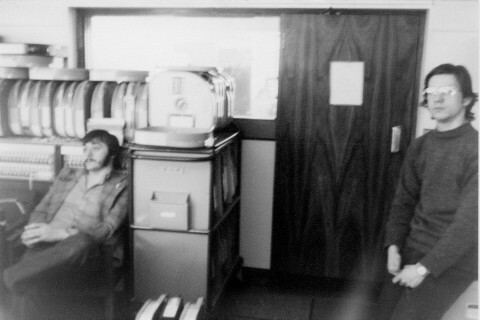 The first photo shows VT editors Nigel Evans (who now works for Avid) and Tim Savage (now an editor and colourist). I think it is Brian himself in the other photos. Pete Simpkin: I remember all the RCA TR22s had a kick dent in the modules near the floor which was the only way to stop video flashing during the run-up! Steve Dellow: Ah – the old ‘Quad’ machines. As featured extensively in ‘White Powder Christmas’ and ‘Good King Memorex’! That is me drinking the tea and posing with the clip board. I think I was recording “Angels”. 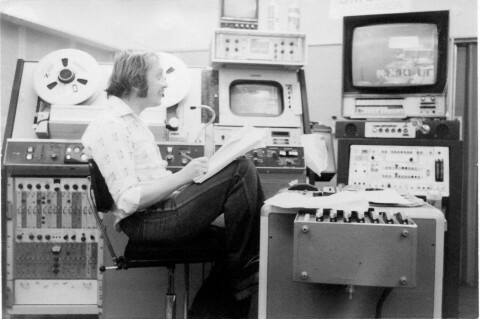 Nigel and Tim are in VTB and I am in VTC which was a pair of Ampex VR1200s with a shared timebase corrector(TBC). My foot is resting on the quarter inch machine used for mixing sound joins across edits and hanging on the end nearest the camera is a remote control for the vision mixer in TV studio C which VT used for vision mixing by borrowing a machine from VTA or VTB.